Pink eye is a funny thing. It’s highly contagious so kids have to stay home “sick.” The only problem, from my point of view, is that they’re not really sick. He had no symptoms, other than some slightly reddish eyes. So he wasn’t sad cuddle boy, but energetic and lively. He and his younger sister spent the morning chasing each other with nerf swords and trying to talk in their tin can phones. They know they’re supposed to stretch the string to make it work, but they didn’t understand that standing directly above his sister on the second floor talking over the railing defeats the point. But on the bright side, he kept his sister occupied. The only question I had to answer was “Is it lunch time yet?” Of course she started asking that at 8:30 in the morning, and repeated it every hour after that until I declared that it was indeed time for me to start making lunch. As I was washing my hands and pulling out the ingredients she asked in her most exasperated tone “What is taking so long?! ?” She was then sent to her room, mostly for her own safety. The reason she was so excited for lunch was because she accompanied me to the grocery store the day before and got me to buy the items for her current favorite lunch – cucumber sandwiches. I made them the first time for her fourth birthday tea party and she adores them. Here are my sandwiches, easy, cool, light, and perfect for a summer afternoon. Or a cold windy day, it doesn’t really matter. Ingredients: an English, or hothouse, cucumber (a regular cucumber should work fine) peeled and sliced. 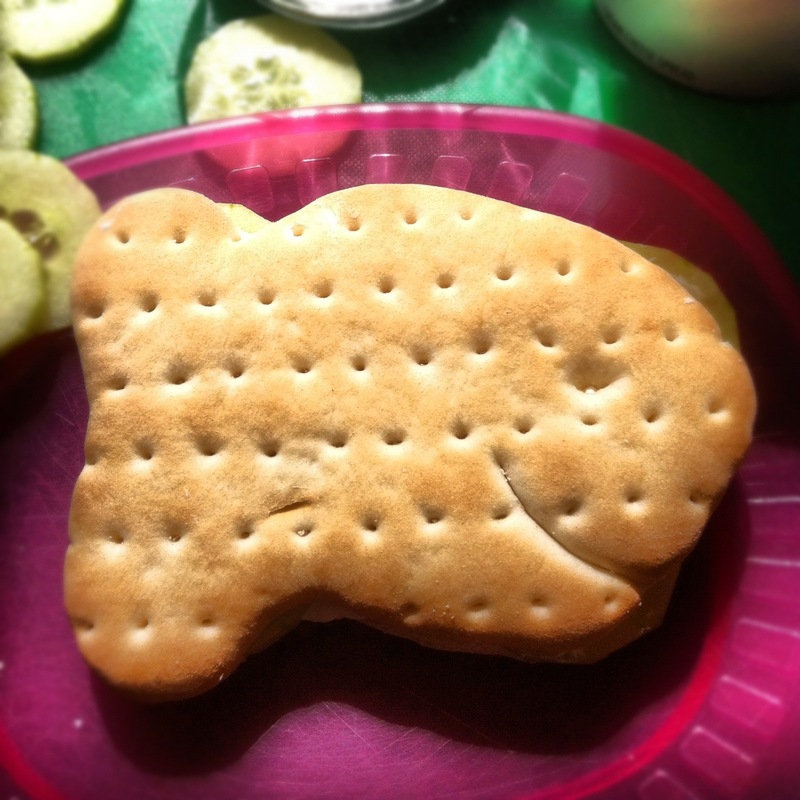 Some kind of thin bread, I use Goldfish bread to make it more fun for the kids, cream cheese, and a little kosher salt. 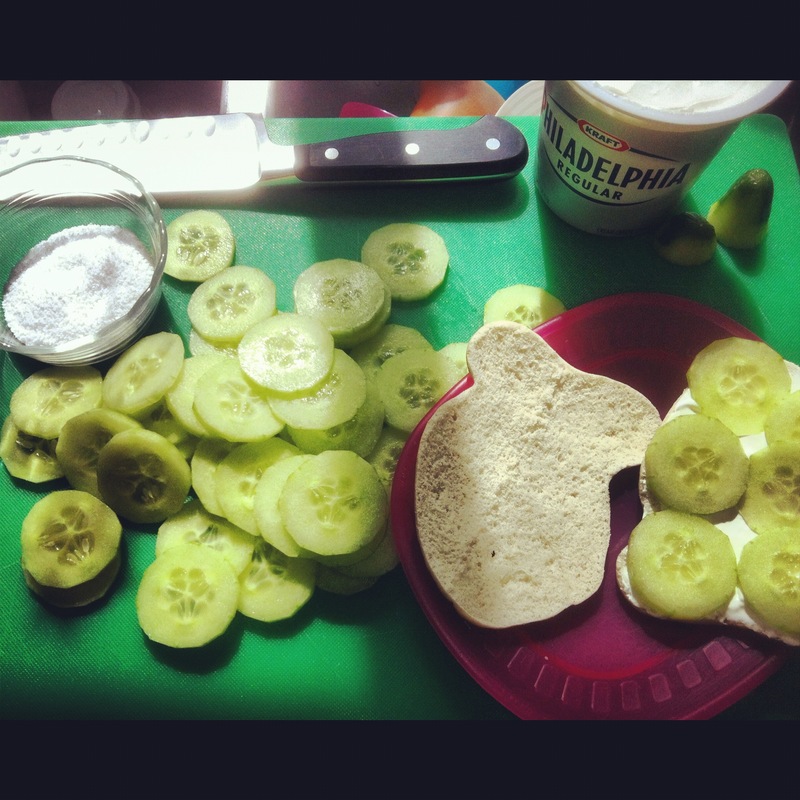 Spread cream cheese on one side and layer on some cucumber slices. Sprinkle some kosher salt over the cucumbers. Top with another slice of bread that has more cream cheese. That’s it, easy-peasy. They travel pretty well in some Tupperware and you can dress them up with dill or watercress, anything your kids might like or tolerate. I had some leftover raw shrimp from the previous night’s dinner so I cooked that up quickly and added it to my own sandwich. Yummy! I sliced the little guys down the spine so they would stay flat on my sandwich and not roll off onto the plate. I may try this with smoked salmon, it may work since two out of three kids in this house have a thing for smoked salmon. 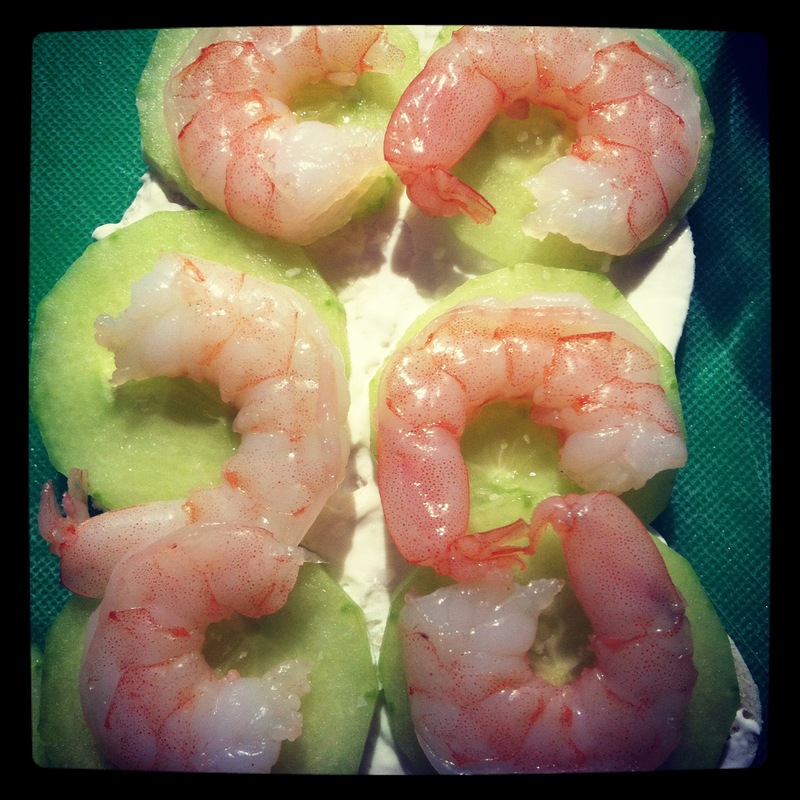 This entry was posted in Instagram, Parenting, Project 366, recipes and tagged conjunctivitis, cream cheese, cucumber, Instagram, Pink eye, project 366, recipe, sandwich, shrimp. Bookmark the permalink.